Yes, I have reached the point in the month of November when I am asking myself, frequently, ‘Why am I participating in NaBloPoMo?’ One answer is the choice to challenge myself; with an external motivator (accountability) I find that I become more stubborn and committed. Twice a year for the last seven or eight years, I have participated in a two week Ayurdevic cleanse (see explanation here) which is challenging on many levels. I always contemplate ‘bailing’ from the cleanse midway and I’m always glad that I have done it, at the end. The same thing was true with doing NaBloPoMo last year. But that’s another, ‘Why?’ isn’t it? What is it about choosing to take and then meeting a challenge that feels good? Speaking for myself as an individual, I know that truly feeling a sense of accomplishment is rare and difficult. Other people can tell me that I have accomplished something significant (small or large, brief or long lasting), but I am not able to take that in, to feel the sense of accomplishment. Don’t know why, always been that way. Speaking as a sample member of humanity, I wonder if some accomplishments just seem too ephemeral? Have we (perhaps I need to qualify ‘we’ as western culture…) become trapped by our concrete thinking? Does this explain, in part, the avarice, the drive to acquire money and possessions to establish achievement? 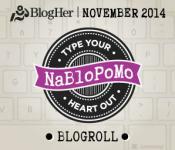 This entry was posted in Writing and tagged NaBloPoMo 2014, why?, writing by Assembling a Cooking Life. Bookmark the permalink.